particular step in this log, please contact us and we'll forward a full resolution pic package. February 9, 2015 - Began sealing the shell to the frame. February 8, 2015 - Shell cleanup and tail light assembly removal. May 31, 2014 - Vent covers and television antenna removed. May 30, 2014 - Air conditioner removal. May 26, 2014 - Secured the shell structure to the frame. May 25, 2014 - Mating the shell to the frame...continued. May 24, 2014 - Mating the shell to the frame...continued. May 19, 2014 - Mating the shell to the frame...continued. May 18, 2014 - Began mating the shell to the frame. May 6, 2014 - Tongue jack reinstalled. May 4, 2014 - Frame turned over and back on the wheels. April 27, 2014 - Frame safety chain mounting brackets and new safety chains installed. April 20, 2014 - Frame safety chains and tongue jack stabilizer removed. April 6, 2014 - Belly skin seams sealed. March 30, 2014 - Frame closeouts sealed. March 23, 2014 - Fabricated and installed the aft frame closeouts. March 22, 2014 - Curbside corner damage repair; fabricated sewer hose storage closeout. March 18, 2014 - Curbside corner damage. February 23, 2014 - Finished fabricating tongue closeouts. February 9, 2014 - Began fabricating tongue closeouts. January 26, 2014 - Fabricated the step closeout. January 25, 2014 - Belly skin fabrication completed. January 19, 2014 - Subfloor insulation completed; continued belly skin fabrication. January 18, 2014 - Final center belly skin fasteners installed; more subfloor insulation. January 1, 2014 - Gray water tank covers completed. December 31, 2013 - More tank cover work. December 30, 2013 - More belly skin and tank cover work. December 1, 2013 - Additional work on the 6 gallon tank cover. November 10, 2013 - Rivets installed in tank covers. Rivnut installation illustrated. November 3, 2013 - Completed fabricating the tank covers. November 2, 2013 - Began fabricating a cover for the 9 and 18 gallon tanks. September 29, 2013 - Skinned the undercarriage above the axles. September 28, 2013 - Skinned the undercarriage just aft of the wheel wells. September 22, 2013 - Aft belly skin section fabrication completed. September 15, 2013 - Aft belly skin section fabrication. September 14, 2013 - Subfloor insulation. September 10, 2013 - Fun and adventure at Tulsa Auto Spring. September 2, 2013 - Fabricated 6 gallon tank cover closeouts and template for next section. September 1, 2013 - Began gray tank cover fabrication. August 29, 2013 - Wired the tank level sending unit for the gray tanks. August 24, 2013 - Original belly skins pulled from storage. August 18, 2013 - Wheel wells sealed; bathroom drain secured to cross members. August 15, 2013 - Removed a leaf spring to be used in fabricating a new spring set. March 30, 2013 - Frame inverted. March 24, 2013 - Preparing to invert the frame. March 16, 2013 - "C" channel installation completed. February 26, 2013 - Installed front center "C" channel section. February 24, 2013 - Installed front "C" channel corner sections. February 3, 2013 - Fabricated remaining "C" channel corner sections. February 2, 2013 - Installed gray, black tank level sending units; began work on "C" channel. January 27, 2013 - Finished securing subfloor to frame. January 24, 2013 - Acquired new "C" channel; acquired pop rivets for belly skin install. January 20, 2013 - Gray and black water drain system functional check. January 19, 2013 - Subfloor secured to the frame. January 12, 2013 - New scare light acquired; brake wiring installed. December 31, 2012 - New marker light assemblies acquired. December 9, 2012 - Removed filler neck from aluminum fresh water pressure tank. December 8, 2012 - New tail light lenses acquired. November 25, 2012 - Drain valve flashing part 2; installed sewer hose carrier; installed step. November 24, 2012 - Painted the sewer hose carrier. November 23, 2012 - More paint on the step; stripped paint off of the sewer hose carrier. November 13, 2012 - Sewer hose carrier cleanup. November 4, 2012 - Subfloor sections spliced together and placed on frame. November 3, 2012 - Finished sealing the top of subfloor section 1. 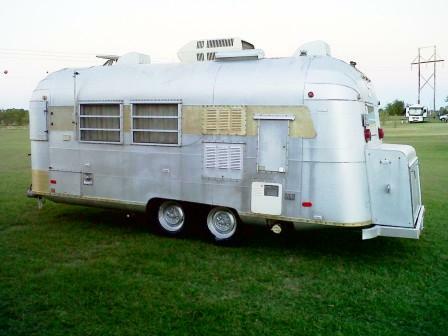 October 31, 2012 - Picked up aluminum for belly and interior. October 30, 2012 - Finished sealing the bottom of subfloor section 1. October 29, 2012 - Began sealing subfloor section 1. Brake wiring acquired. October 28, 2012 - Subfloor section 4 sealed; bathroom sink drain connected to gray tank. October 24, 2012 - Entry handle and emblems picked up from the chrome shop. October 23, 2012 - Subfloor sealing continued. Tested corrugated fastener installation. October 22, 2012 - First fasteners installed in subfloor. October 21, 2012 - Subfloor sealing continued - three of five sections completed. October 20, 2012 - Subfloor sealing continued; began installing drain pipes. October 14, 2012 - Gray tanks installed; wheel well alignment verified; began sealing subfloor. October 1, 2012 - Fabricated new subfloor shield/drain valve box roof. September 30, 2012 - Fitting of the subfloor completed. September 24, 2012 - Began work on the new subfloor. September 20, 2012 - Entry handle and emblems delivered to the chrome shop. September 15, 2012 - Picked up marine plywood for subfloor. September 10, 2012 - Wheel well painting completed. September 9, 2012 - Finished painting the frame; started on wheel wells and step. September 3, 2012 - First coat of paint applied to the frame. September 2, 2012 - Frame cleaned and etched. August 26, 2012 - Frame prep complete. Tongue jack reconfigured. August 19, 2012 - Began frame prep for paint. August 14, 2012 - 9 gal tank slide stops added; bathroom sink drain pipe rests added. August 13, 2012 - Weld cleanup on the gray water tank supports. August 12, 2012 - Gray water tank support welds completed. July 28, 2012 - Reinforcements welded to the cross member. July 26, 2012 - Cross member and tank support reinforcement. June 17, 2012 - Below floor plumbing layout completed. June 10, 2012 - Finished fitting installation; leak checked tanks. June 9, 2012 - 9 gallon tank fittings installed; 18 gallon tank prep. June 6, 2012 - Began welding fittings to 9 gallon tank. June 3, 2012 - Tank vent and drains located. June 2, 2012 - Tank straps drilled and bolted in place.